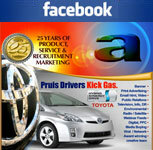 Web Design, Marketing and Advertising for all media and all businesses. The advantage A Work Of Art, Inc. a Florida Based company, brings to business owners nationwide is a full service web development company and Advertising / Marketing Agency with over twenty five years of success in business by bringing our clients great success. Web design clients also utilize our print design services, and businesses that hire us for national Advertising campaigns enjoy the fact that we fully develop their web based needs such as database work, blogs, social media networking and marketing, search engine optimization (SEO), custom web design, pay-per-click campaigns, e-commerce and more. Our clients save time and money because we have a handle on their entire marketing and development effort. It’s quite an advantage when you can rely on just one company that can cross platform all of the aspects of your marketing, advertising, production and development with different media and tie them all together into one cohesive campaign and message.Our experience and leadership in advertising, design and marketing has been doing this for over twenty five years. 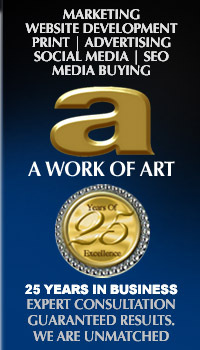 We have won numerous national and local awards for design, advertising and marketing effectiveness. It’s important to have a consistent message and uniform look in your television, print, and web based branding and advertising and be able to quickly adapt and produce without impeding factors such as communication conflicts or transferring of data which is the result of too many different vendors or agents assigned to a variety of separate responsibilities. Time and money are also a factor. When you have one competent and talented company in charge of your complete advertising and marketing effort there is no waste of time, energy or overlapping of resources which dramatically allows you to put more of your budget to better use. – David Nagle / Creative Director, A Work Of Art, Inc.